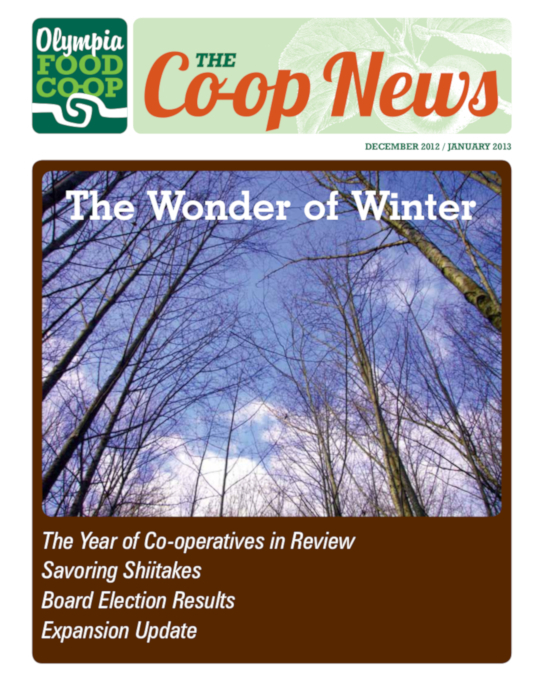 When we heard that the United Nations designated 2012 to be the International Year of Cooperatives, the Board and staff felt immediate excitement. 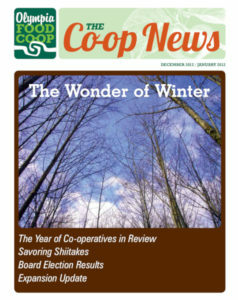 Finally, co-ops would get some well earned recognition as a business model that works! And we asked ourselves, how can we best participate, both for our own education and to further our goal of supporting the cooperative movement? Staff at the Co-op are proud to be part of a movement that proves respecting people is good for business. Millions of consumers around the world have joined cooperatives for many reasons, including finding that they fill a need for housing, electricity, food, insurance and financial services … the list is endless. In the United States, 30,000 co-ops provide two million jobs, and one of every four people is a member of a cooperative. Cooperative values connect us as people and also transcend co-op size. It doesn’t matter whether your cooperative is so large that it employs thousands of people, or so small you can fit everyone involved in a single room; co-op values remain the same. conventional grocers). They contribute to the community with high levels of charitable giving, an average of 13% (compared to 4% for conventional grocers). Plus, food coops generate more money for their local economy – 1.5 times more than conventional grocers. So, whether you are supporting the Olympia Food Co-op or another, know that your purchases do make a difference! Co-ops demonstrate their commitment to ethics by extending them in an ever widening circle. When a co-op makes a profit, you can be assured it was gained through fair business practices, and in most cases, any surplus is reinvested in the co-op or shared equitably among member-owners. I have personally enjoyed learning more this year about the many types of cooperative businesses in this country and others over the last year. For example, Whatcom County now has a worker owned healthcare co-op started about four years ago called the Circle of Life Caregiver Co-op. Their co-op is dedicated to excellent home care for the elderly and disabled. In an industry rife with low-pay and apathy towards clients, Circle of Life offers a refreshing alternative, where self-help provides everyone with more options. We know none of the great things co-ops accomplish would be possible without the people worldwide who use co-ops to meet their needs. This year, celebrating with the millions of others who love co-ops, we are thrilled by the international recognition of co-ops’ fundamental values: that making people and communities our top priority is good business.